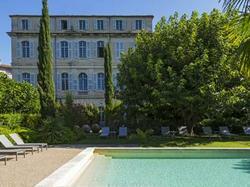 This Chateau is located in Mazan, at the foot of the Mount Ventoux. It has an outdoor swimming pool and offers rooms and suites with views over the landscaped gardens and floral terrace. Each guest room at the Chateau de Mazan is equipped with air conditioning and satellite TV. Rooms also have a spacious private bathroom. The Mazan Chateau?s features a gastronomic restaurant, L'Ingénue, which serves traditional cuisine. There is also a bar and a 24-hour reception with free Wi-Fi access. Free parking is available on site and the Chateau de Mazan is situated 30 km east of Avignon, in the south of France. It is an ideal base for exploring the region. By car : Leave the a7 motorway at Avignon Nord and follow the directions for Carpentras on the d942 - From Carpentras follow Mont Ventoux then Mazan retaking the d942. On arrival at Mazan take the first road on the right after the Town Hall (mairie) and then the first road on the left. By plane : The nearest airports are : Avignon (40 mn), Marseille (1h30), Lyon (2h30), Nîmes (45mn), Nice (2h30). By train : Avignon station is served by the TGV Méditerranée: Paris-Avignon: 2h40 London-Avignon : 6h Lille-Avignon: 3h45 Lyon-Avignon: 1h We are 30 minutes by car from Avignon TGV station. The main car rental companies can be found outside the station. Have your meal on a large terrace in the shade of a century-old locust tree.The castle lounge houses two restaurant rooms decorated with 19th century moldings. The number of restaurant seats being limited, the hotel advises you to make a reservation in advance. Please note that the Charm Room cannot accommodate extra beds. This large suite is situated in the Chateau has a private bathroom with a view of the garden. These spacious rooms have a bathroom with a bath. They are situated either in the guest house or the chateau.